Kino on Video Web site. The King of Kings is possibly DeMille's most widely seen and ballyhooed production. Telling the story of Jesus, from the redemption of Mary to his Ascension, DeMille directs us through a "greatest hits" of the New Testament while emphasizing the scenes that allow him to create painterly visions from the Bible. H.B. 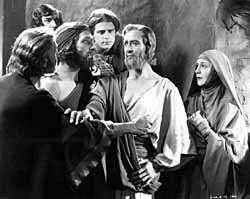 Warner as Jesus Christ in The King of Kings. The King of Kings is a movie about trying to recreate classical works of art (by DaVinci and others) and transfer them to the big screen. The movie assumes a mood of quiet elegance that becomes both beautiful and artificial. As portrayed by H.B. Warner, The King of Kings gives us a god-like Jesus of gentle and benevolent movements who is always in control on the situations. Unlike some modern interpretations, such as Martin Scorsese's Last Temptation of Christ, which emphasized the human side of Christ, The King of Kings gives us a deeply reverent portrait of Jesus Christ. But when the crucifixion scene arrives, DeMille rips loose with some powerfully staged visions of an apocalypse. William Boyd (of Hopalong Cassidy fame) plays Simon of Cyrene and steps forward to help carry the cross. All hell breaks loose as Jesus dies on the cross, with earthquakes ripping open the earth and lightning turning the night into day. Also, look for famous fan dancer Sally Rand as Mary Magdalene's maid! "Cecil B. DeMille: The Visionary Years, 1915-1927": The six videos comprising this set are available from Kino on Video. Suggested retail price: $29.95 each. For more information, we suggest you check out the Kino Web site: http://www.kino.com.